Prosecute the politicians and crony networks accused of corruption. Civil society networks, for example the network to oppose corruption, public interest organisations, and independent bodies, should accelerate their investigation and prosecution of wrongdoers. They should prevent politicians and crony networks from using the worst populist policies to gain power in the future. Synergy is needed for civil society to look for solutions to respond to farmers and society. The commercial banks, which altogether make more than 170 billion baht per year in profits, the millers and the export traders should allow rice farmers to use their unpaid rice delivery receipts to borrow money, while the government acts as guarantor and pays the debt interest. Farmers could also reduce the area they monocrop and switch to integrated agricultural systems for example breeding fish in the rice fields etc. This would reduce production risks, lower production costs, and also increase food self-sufficiency at the same time. Set up a land bank to address the problem of landless farmers. 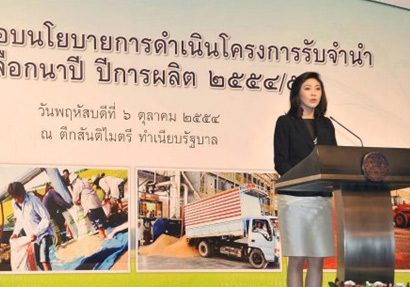 By investing as little as 100 billion baht per year, the government could help farmers rent to buy land. This could resolve the problems of the one million landless farmers within the next 4-5 years. This would reduce production costs in the long term by about 25% in the central region. Develop an irrigation system for smallholder farmers At least three quarters of the budget of the 350 billion baht Flood Prevention Scheme projects should be used for setting up a small-scale irrigation projects to increase the total area with access to irritation. This would increase our total irrigated agricultural area from just 23%, and bring Thailand closer to Indonesia, Vietnam, Philippines, and Malaysia which have irrigated areas of 54%, 55%, 62%, and 65% respectively. Amend policies supporting chemical-reliant agriculture and monocropping towards supporting organic agriculture The government, the Ministry of Agriculture and Cooperatives and agricultural training institutions in Thailand must change its focus from fossil fuel dependent agriculture towards achieving at least 50% organic agriculture or sustainable farming in the next 10 years in order to address the food and energy crises as well as to help farmers adjust to the low agricultural commodity prices of goods that will flow in from neighbouring countries when the AEC is in operation. Amend the policy of commodity price support towards sustainable support for peasant farmers Convert the rice pledging / income guarantee schemes into schemes which would support change towards sustainable agriculture, help farmers in the event of natural disasters, and increase the welfare system to provide for health and education expenses of farmers dependents.